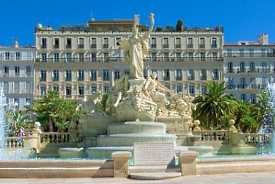 Toulon is the principal naval base of France, with a gorgeous harbor and a town surrounded rolling hills and fortresses. The town boasts a winter resort and a wonderful pedestrian zone in the core of the old city, filled with shops, hotels, restaurants and cobblestone streets. In the summer, visit the Plage du Mourillon, the best beach in town.